Tried Studly Utility: first, disabled torrents - no luck. Next, reset wrapper - still no luck. Tried slapping it in the face - no luck. Finally tried safe mode - still not launching. The loading bar goes to about 65% and just stops. I expected there to be a hangup, so I'm not shocked - just disappointed. Try [World of Tanks] [Troubleshooting] [Reset Wrapper] with the Studly Utility. Amazingly, after remove WOT with Study Utility and re-install the game, it worked. No freeze any more. Just installed update 1.0 on Mac, loading screen stops at about 70% and hangs. Shutdown and restarted, same issue. Any ideas??? Anyone? Hmmm ... those are all the right steps. What are the specifications of your Mac hardware including OS version? What are your Mac hardware specifications and OS version? I am not experiencing this or any issues on my MacBook Pro or iMacs - but they have dedicated video cards so am trying to see if this issue is specific to discrete video cards. Hmmm ... usually only recommend that as a last step - but glad it worked for you. What are your Mac hardware specification and OS version? It appears from Tanker_Tiger that un-installing with Studly Utility and re-installing worked for them. Usually that is a last step but you may want to consider. NOTE: Un-installing with the Studly Utility deletes your replays folder. Make sure you back-up that folder if you want to keep your replays. Highly recommend that you go to the Wargaming webpage and download the latest WoT Mac Wrapper from there versus using an [old] DMG. Normally there is a delay loading into the server - I have seen it by almost a minute sometimes - exactly how long did you wait until you gave up? Edited by Sgt_Rock357, Mar 21 2018 - 19:00. I gave it 30 minutes the first time, about 5 minutes each time after that. Still trying a few things, will post here if I get anything useful. Deleted the app from the applications folder, then reinstalled. It's working now! Only played one game, so I'll keep you posted if there are any glitches. Update: got it to work by deleting the world of tanks application from the application folder and deleting my world of tanks folder as well. Reinstalled a fresh installation from the World of Tanks website and managed to get past the loading screen and start playing. I made sure to restart my computer as well. Well this is weird, it finally loaded, took almost 18 mins to get to the logon window to connect to the server. Now to try to quit and reload game....does take a long time to log off and quit game too....forced quit game. Restarted, loading screen opened took about a minute this time, got to logon screen and logged on, game launched, laptop temp already at 165 degrees. Maybe it takes a long time for wine to initialize the update and launch. Seems to be working now.....time to give it a shot! Thanks to all who made suggestions!!! Yeah - the game is pretty demanding on your video card and you should always expect the fans to spool to full-speed after a minute or two while playing the game on a portable. I have run, for several years, Mac Fan Control which allows me to have the fans respond to the GPU diode temp versus whatever macOS monitors to avoid the OS limiting processor speed/shutting due to too high an internal temp. Easy to set-up, it is free, and for me there is a MS Windows native app which I use as MS Windows seems to be even worse than macOS in monitoring temps and spooling up the fans appropriately. Mac Fan Control is produced by CRYSTALIDEA - just do an Internet search. Edited by black_colt, Mar 21 2018 - 19:41. Tried Studly Utility, disable torrent and reset wrapper didn't work. I reinstalled and it worked! So reinstall everybody! I will reach out to CodeWeavers and ask them to look at the replies on this Forum to see if this is a one-time issue or a precursor of something more serious. If that does not work - then delete the WoT Mac Wrapper and the WoT folder in [Documents] and re-install using the latest DMG from the Wargaming webpage. You can use the Studly Utility to to this. 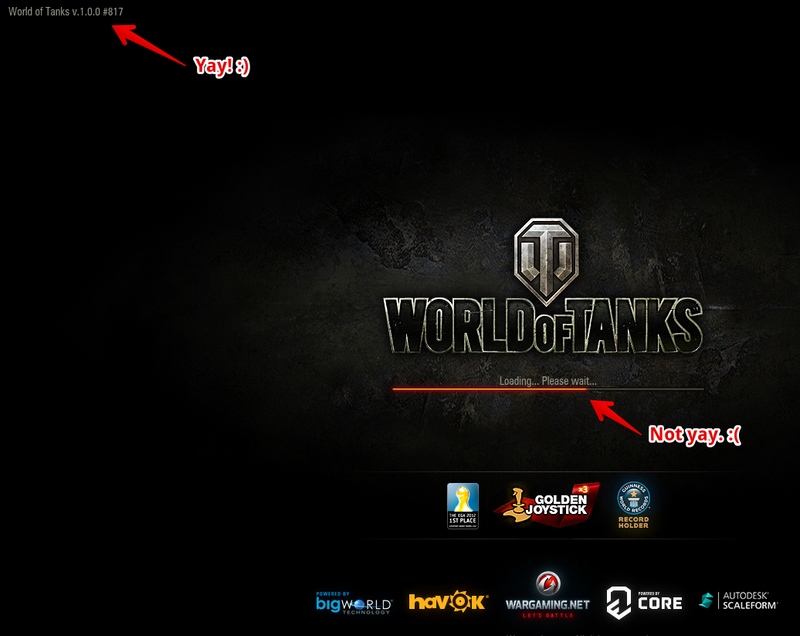 REMEMBER: Deleting the WoT folder in [Documents] deletes your replays. If you want to keep your replays MAKE SURE you back-up the [replays] folder. Thanks for all the posts to the thread - this is how we solve issues for the Community. And I should have mentioned this when starting the thread - please include your Mac hardware specifications and the version of OS X/macOS you are running. Why? It allows us to quickly see if it is an issue related to a specific hardware spec - e.g. discrete - and/or OS version. My client freezes in the middle of battle. Tried disable torrent, reset, fresh install, restart, but the freeze still happens every 1-2 games. Considering updating to osx 10.13, but I don't think that will help. Anyone not having any freezes? What is your setup and OSX version?